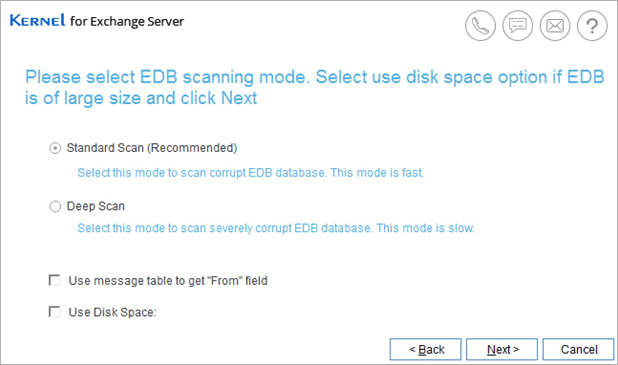 EDB files are the Exchange Server Database Files and if these files get corrupt then Outlook cease to process as the Exchange Server can no longer available. In such case to continue working with Outlook, one method that can be adopted is converting EDB files to PST. One the Exchange Server Database gets repaired then work flow can be resumed until then it is better to convert EDB files to PST. The best method to convert files is by using EDB to PST Converter. The tool converts the inaccessible EDB files to PST, which can be used by Outlook. Kernel EDB to PST converter extracts all the important files to PST in a structured manner without disturbing the integrity of Exchange Server Files. It allows users to export all offline EDB files to PST. Have a look at some of the interesting features of Outlook. When the Exchange Server encounters any error it affects the database files, and damage to database files leads to corruption of entire server. So, it is highly needed to convert EDB files to PST quickly. E-Mail Search Feature: If you have some important mails and data in EDB files, you can search these mails to assure these files get added to conversion process. Kernel EDB to PST Converter allows you to search mail via subject, contents in message body, From, To, CC. You can sort mails on the basis of Attachment, read status, date and other parameters. 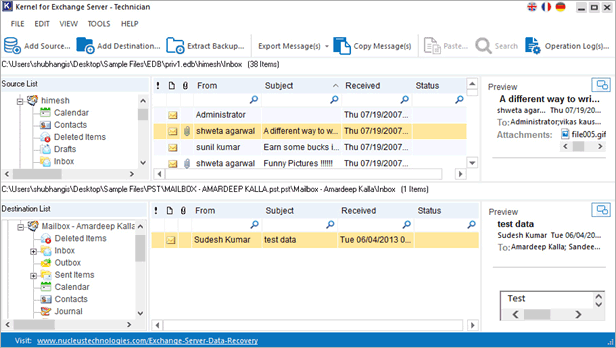 Able to Recover EDB Files of Large Size: The EDB to PST tool is able to convert large EDB files to Outlook PST format. Kernel EDB to PST Converter save each mailbox to separate PST file and in such case if the size of mailbox is large, the data can be saved in multiple PST files with the split PST option. Easy to Use EDB to PST Converter: There is no specific knowledge required to use Kernel EDB to PST converter. It’s self guided user interface instruct the user at every step. There is no need of log files for data recovery. Just follow the GUI based tools like drag and drop, copy and paste to move EDB files to PST. Save Files in Other Formats: Apart from converting EDB files to PST, you can convert the EDB files to MSG, EML, RTF and HTML format. 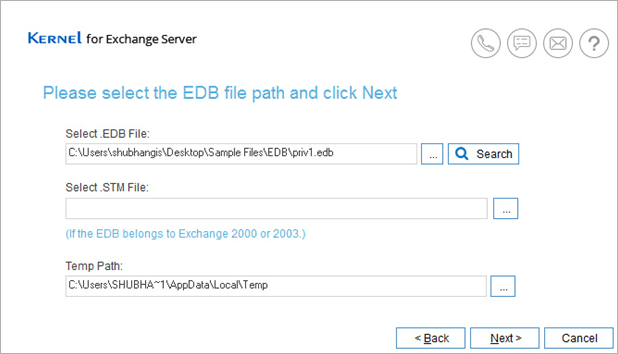 Moreover the advanced version of EDB to PST tool allows to convert to Live Exchange, Office 365 and other email hosted accounts. Compatibility and Support: EDB to PST converter is compatible with Microsoft Outlook 2016/ 2013/ 2010/ 2007/ 2003/ 2002/ 2000 and previous versions and you can use Kernel EDB to PST tool with 2016/ 2013/ 2010/ 2007/ 2003/ 2002/ 2000/ 5.0 and others. Now you are prompted to select recovery/ scan process.